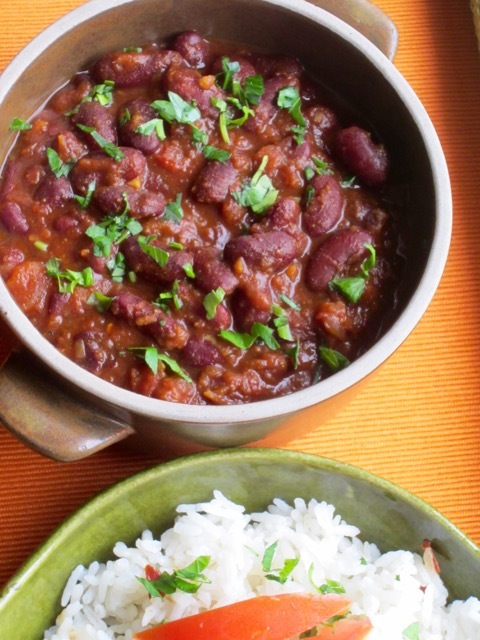 We cook this bean curry, at least once a week. It’s very delicious. Please ensure you boil the beans until they are very soft and falling apart. Also make sure you do not drain the water after boiling. I wish you a pleasant week! 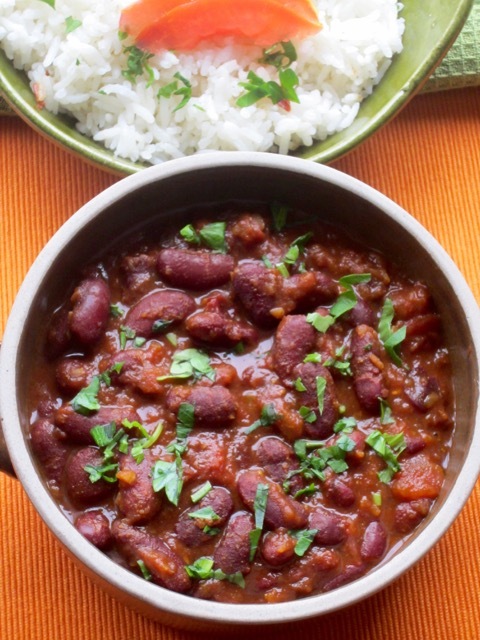 Boil the beans: wash the kidney beans in cold water until the water runs clear. Soak the beans for at least 8 hours or overnight. Discard the soaking water and rinse the beans under running water in a colander. 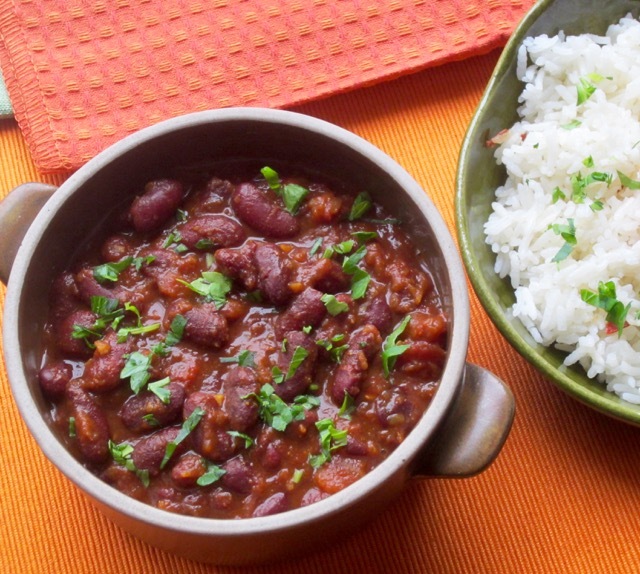 Place the beans in a large pot, add 5 cups of water, garlic powder and chill flakes and bring to a rapid boil, then reduce the heat, and simmer, partially covered for 60-90 ,minutes until beans are soft and falling apart. 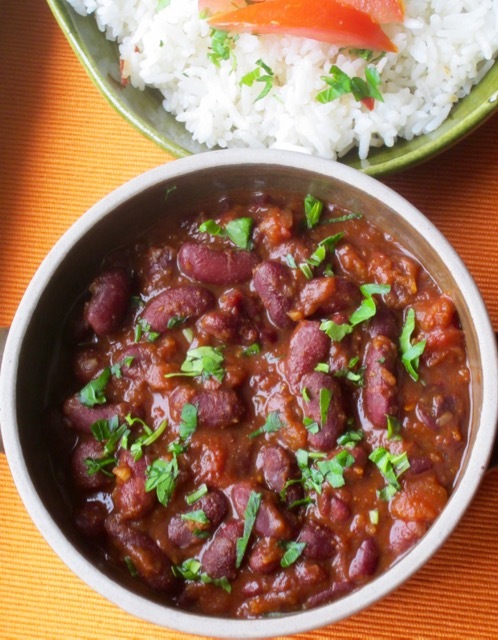 If using pressure cooker cook the beans for 1 whistle on high then reduce the heat to low and cook another 10 minutes. Set pressure cooker aside for pressure to go down then open the lid. Cook the onions: Heat the oil in a pot over medium heat. Add the bay leaf and cook 30 seconds, then add the chopped onions with a little salt. Cook the onions stirring from time to time until they turn light brown in colour. Now add the ginger and garlic and cook for another minute. Cook tomatoes: now add tomatoes and cook stirring from time to time over medium high heat until all the moisture evaporates and the oil starts separating. Add the spices: now add all the spices (chilli flakes, turmeric, coriander, cumin and garam masala) and cook for another minute. Season with salt. Add the boiled beans: now add the boiled beans along with the boiling water and mix with the spices. Simmer for 10 minutes. Adjust the thickness of the beans by either adding more water or boiling rapidly to reduce water, if it’s too much. To get a thick gravy, mash some of the beans in the pot with the back of a round spoon. Serve: just before serving, add the chopped coriander and serve the beans with rice or flat bread. Add the chopped onions with a little salt. Cook the onions stirring from time to time until they turn light brown in colour, then add the ginger and garlic and cook for another minute. Cook tomatoes then add spice: now add tomatoes and cook stirring from time to time over medium high heat until all the moisture evaporates and the oil starts separating. Add all the spices (chilli flakes, turmeric, coriander, cumin and garam masala) and cook for another minute. Season with salt. Add the boiled beans along with the boiling water and mix with the spices. Simmer for 10 minutes. Adjust the thickness of the beans by either adding more water or boiling rapidly to reduce water, if it’s too much. To get a thick gravy, mash some of the beans in the pot with the back of a round spoon. 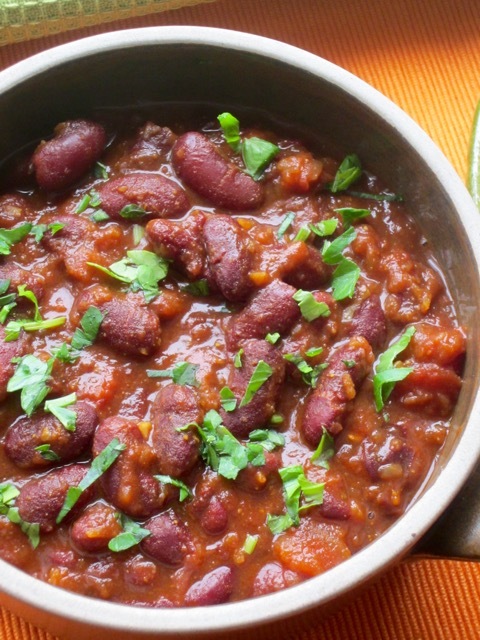 Just before serving, add the chopped coriander and serve the beans with rice or flat bread. For 3 cups I added 7 cups water and still had 3½ cups cooking water left. To get really soft you’ll have to soak them for 6-8 hours or overnight and then cook them for at least 1½ hours. For 3 cups beans I added 6 cups water. This is an Indian twist with spices. It tastes awesome!!! !